No. 10, Jalan Sungai Keramat 3, Taman Klang Utama, 5th Mile, Jalan Kapar, 42100 Klang, Selangor, Malaysia. 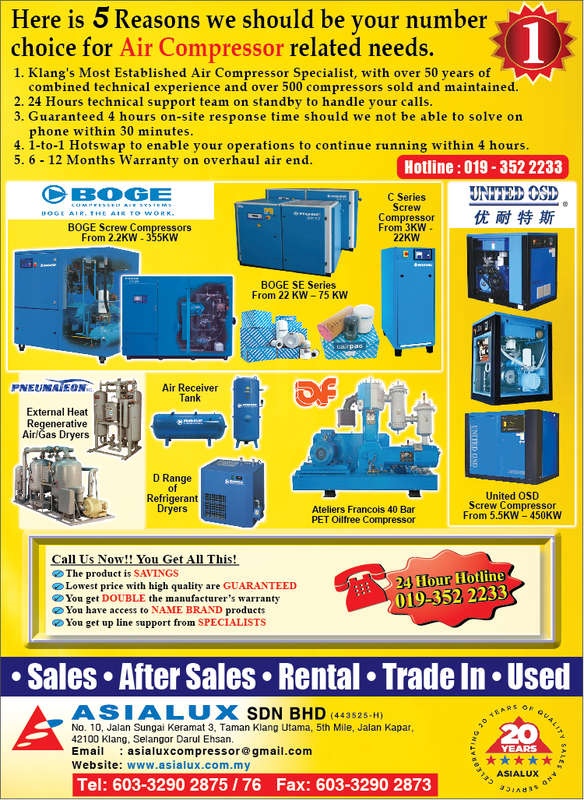 Asialux is a most established air compressor specialist in Klang specializing in consulting, selling, maintaining and overhauling air compressors. We show you what you need to do to ensure completely reliable manufacturing environment, allowing you to focus on what you do best – manufacturing the highest quality products in a timely manner. In the past 21 years, we have helped over 310 customers throughout Malaysia in food & beverage industries, packaging & glass industries, motor vehicle industries, Cement & construction industries, furniture & wood timber industries, plastic & electronic industries, general manufacturing. Our management team’s 44 years of combined experiences allow us to solve even the most complicated technical issues in a speedy manner. In fact, we are the first in the industry to offer a written guarantee: 48 hours to resolve issues or have a compressor swapped to allow uninterrupted operations while we resolve the issues at our own facilities. Air compressor was the most essential rotating equipment for all manufacturing utility process. Asialux as a leading sales and after sales provider is able to offer you ZERO downtime in compressed air supply where provide you with numerous return by just engaged us as a service provider for your compressed air need. Our mission statement : Ensuring customer ZERO DOWNTIME with our products and services.